Farro with Chili Roasted Broccoli and Hummus | Naturally.Farro with Chili Roasted Broccoli and Hummus | Naturally. An easy grain-based meal that comes together with the help of my chili roasted broccoli. Perfect with or without an egg. Prepare the broccoli according to the directions. Reserve leftover broccoli to use in another meal or prep only 1/2 of the component recipe. 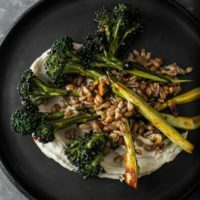 Toss the broccoli with the cooked farro and serve over a smear of hummus. Top with a fried egg if desired. Tips + Tricks: I love farro for the texture but you could use any leftover grains you might have. I just recommend reheating them on the stove-top before tossing with the broccoli.